Wowzers! Check out that 62 inch screen on that SEGA Rambo cabinet in the gallery below. 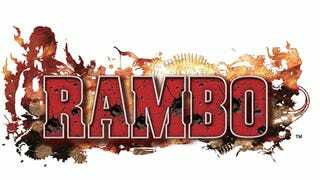 The Japanese game developer has released a few new screenshots of the arcade title, complete with in-game scenes from Rambo flicks. The game features an "Anger System" that pissed off John Rambo shooting power-up mayhem. Yes, wee think everyone can all agree: This game looks like a helluva good time.